Since this is General Discussion I thought that was the right place for this. Many Members & New Members use avatar, some of those may be unknown for most of the users, didn't you sometimes thought: "What that avatar represents? What is it?". Well, this thread is perfect for explaining it and talk about it. Ok, I'll start from my avatar: finally I changed this with a customized image taken from Pokemon Diamond Bootleg (Telefang) and it shows Bek (Shigeki) in the Title Screen cutscene where he calls with the D-Shot his Electric Monster. I changed my avatar in this and I'm thinking I'll probabilly left this one as definitive, since it seems also the main protagonist of my first hack that seems Bek. Well mine is Tifa Lockhart from Final Fantasy VII. Mine is my character from Phantaasy Star Online 2. She is a female Newman and her main class is Ranger, with Force as a subclass. I named her MoonMoon, even though that makes no difference in the actual game. Haha. My avatar is came from an online game called Soldier Front (it's a FPS game). It is a 5 star general rank. And only a game master (Gm) can have it. Mine is just a blastoise! So its easy to know but i guess tauwesser avatar is a joker sorry! 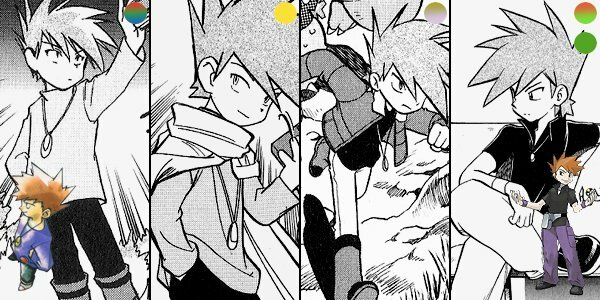 Mine is Adult Blue Oak (Japanese: オーキド・グリーン Green Okido ) is a main character in the manga series Pokémon Adventures . Mine is Wolverine of Pokémon: Lucario! xD He is a very good fighter who has a adamantium body (Steel type), very sharp claws (Metal Claw move). Like Wolverine, he is also very prideful and sensitive to the enviroment. Mine means nothing, just a chikorita coz she's so cute. So what if I made my avatar about 20% cooler? My avatar. Mightyena. My favorite GEN.III Pokémon. Goes with the username too. aah ha! I know Its Flannery . only makes more sense than MoonMoon . Though, I'm changing' mine too. And I'm sure Mateo, You know who's that ? 20% cooler than any other JOHTO Gym Leader(s) right Matt ? . Flannery is about 20% Cooler than the other Gym Leaders. yeah well, I know that, but I'm talking about another cooler one(remember) . Is that means you really don't know who's that ? . I'm sorry for Andy-B 34 because your's avatar which you offered to me, thd size is too large. So, i search it myself. Mine is a Beta screenshot of Pokémon Gold and Silver, in different color modes. hehehe! that old man ah absolutely not dude, I think Mateo can be able to easily answer it . No need to be sorry, be'cause this one is cool! Though, it is a sprite . That avatar which I've offered to you I think that is better one, but this is nice too . I always wondered what you're avatar represents TMOTW . I always wondered what you're avatar represents TMOTW. Yeah. It's only not full resolution, because only 100x100 is allowed. It's resized. I think Andy-B 34 is talking about Clair, because he PM'd me talking about her.